Following the calls and e-mails I received based on the previous post, I thought it might be a good idea to expand on the idea of how climate technology could be used to increase the competitiveness of industry and of certain locales. By the way, you are welcome to share your ideas by commenting and uploading pictures on the blog directly! What do I mean with “climate technology”? Climate technology refer to the many technologies that are now being developed out there, with well-known examples of solar geysers, solar panels and windfarms. But there are many other technologies that are being developed that range from insulations for homes and offices, to home electricity and heat generation. If you dig deeper, then you find that many industries are now becoming aware that they are using electricity to generate heat, and then using electricity to cool things down again (Have they never heard of heat conversion?). So people are generally becoming aware that if they can use less energy to produce a product, that they will ultimately be saving costs and saving the planet. There are many forces for change other than the riots, protests and bickering at international conferences about the climate. Last week the first supermarket chain in South Africa was certified as emission free, with several large retailers like Massmart, Woolworths and Marks and Spencer in the process of assessing their emission footprint. These retail chains are now starting to assess how their COMPLETE supply chains are dealing with the environment.They are not only looking at their consumer goods, but also at their total operation. This is just one way that value chain promotion and climate technology is related. What do I mean with climate technology as a means to increase the competitiveness of industries? Let me first create a picture of the South African manufacturing environment. In general, our manufacturers are losing out to more productive and lower cost Asian producers. But the South African manufacturing industry is still world class in many fields and in many advanced production methods, especially in shorter niche production runs. Furthermore, despite the brain drain that has affected the economy, South Africa still has a rich expert base in diverse technological fields ranging from electronics, metals, to chemicals and all the way to nuclear research. 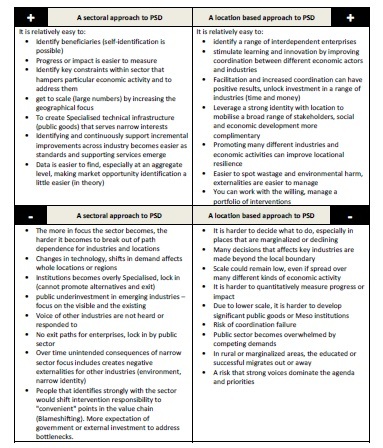 Compared to many other developing countries there is a rich institutional layer (ranging from research institutes to specialised tertiary institutions) that is supporting the private sector. I believe that we should be actively mobilising the South African manufacturing sector into climate technology, as the international pressure on industries, government and consumers will only increase in the future. Many of these different users of technology are going to start making decisions not only the utility of the product that they are purchasing, but they will increasingly assess the environmental footprint of the product. Furthermore, industries that adopt climate friendly technology are reducing costs in new ways, increasing their cost and brand competitiveness. Locales or places that start to promote climate technology might be able to get a headstart on other regions, and there are many places where the scale of environmental or climate pollution could actually be used to start completely new climate technology research and development capacity. I can think of the very sensitive waterlands in the Chrissiesmeer region in Mpumalanga province in South Africa that is under threat from coal mining as an example of an area that could provide a critical incentive for the development of a new industry of climate technology producers and service providers (see feature on the Carte Blanche investigative journalism programme). The demand for this kind of technology is there, yet the environmental lobby is still trying in vain to fight industry. But there are several obstacles, and the first is the limited economies of scale. If the cost of researching and developing new technology is set aside, then costs of finding potential customers (search costs) or applications for new technology is high, and the scale of return is uncertain. Therefore investors are hesitant to enter many market segments. With Southern Africa’s tendency to perform well in small scale and specialised production the risk is lower, if only the producers could identify the right market opportunities. But government and development practitioners would have to play a critical role in supporting this new marketplace, and often public funds is needed to get this kind of initiative off the ground. The current policy obsession with benificiation and final product manufacturing is in my view misguided, and should focus on the strength of the South African industry to develop advanced niche technologies. Secondly, I get the feeling that many people think that this interest in climate technology and the environment is a fad that will go away. Help, any ideas out there? Lastly, as development practitioners we must get business, governments and households to understand that using new climate friendly technology save costs for the society on some new fronts. There is more to it than just saving the planet (although that is a good enough reason), it could also mean increasing the cost competitiveness of a company. It could mean smarter ways of doing thing, like finding ways to generate electricity and heat at a home or a business, instead of digging up roads and building coal fired power stations. So when you conduct your next value chain assessment, ask yourself how the different links in the chain could benefit from technology that is climate friendly. Look at places where heat, steam, chemicals or other byprodycts are generated that may be of value to somebody else. Over the last few years value chains have become an important topic for donors and development practitioners. I say “again” because as with many other topics there is a tendency for these topics to be seasonal (read fashionable). This is great because every time it becomes fashionable new ideas are brought in, while old experiments provide valuable lessons and knowledge. The purpose of this post is not to discuss value chain promotion. Just to make sure you understand what I am going on about, I will briefly define a value chain as the path of a product through a conversion process that starts with design (or raw materials), production, distribution and in some cases even consumption. An agricultural value chain will often start with seed, and will end up as a processed food product. On the mesopartner.com website there are several great publications and a LEDCast episodes on the topic of value chains. attractive, as they typically reach into rural areas, involve a large number of people, create many jobs, and often involve small farmers and less educated workers. But these value chains are also the oldest, which means that the actors have had a lot of time to mobilise strong interest groups, entrenched positions, and comfortable way of doing things. When you look around these traditional value chains, you often find dozens of smaller value chains that are overlooked. Hence the title, “in the shadow of value chains”. These chains include biomass (leaves, sawdust, feathers, etc), traditional medicine and exotic plants (in the case of forestry), wood offcuts (in the case of furniture). In these secondary value chains are typically very small, and may appear insignificant at first glance. But closer scrutiny may reveal some interesting opportunities to start new firms, or to create skills upgrading opportunities for unemployed or unskilled workers. Extreme care must be taken to not raise false hope, or to push the vulnerable into businesses that they are not able to run competitively. It does not matter whether a trust, cooperative, project or society is used, as these are simply means to an end. During the analysis these secondary value chains make an extra effort to see why entrepreneurs have not already pursued this idea or opportunity. Also try to determine what the minimum scale is that is required to pursue the opportunity commercially. The economies of scale typically pose a huge barrier to entry in rural or marginalised areas. I believe that there are huge opportunities in the emerging sector of climate technology and environmental management. I recently saw a biomass to gas converter that can be installed in a community for only a few thousand US dollars. The converter is fed with biodegradable mass and then provides the community with gas for heating, lighting and cooking (another example here). There are many new technologies now entering the marketplace that can give rural areas a complete head start, with biodiesel being a obvious example. It would be great if we can find ways to link cleaner technology and climate technology with new innovative and competitive business processes within the context of value chain promotion! Firstly, do you have any experience in working with these secondary value chains? Which products, technologies or end markets have you worked with? Secondly, do you have pictures of obvious resources or business opportunities that are not exploited? I would like to build up a library of pictures of these products, so please post them to this blog so that we can get a movement going on these value chains. Thirdly, have you investigated CDM and other climate technologies that have the potential to not only save the environment, but to improve the competitiveness of sectors and value chains? If you are interested to read up a bit more on the green news in South Africa, then head over to Urban Sprout. They have a great website and lots of resources and links to keep you busy. If you are keen to get involved in investigating some of the value chains that are often overlooked, and that may offer interesting opportunities for exploiting by-products chains then share your ideas here!